You are here: Home / End the Trend / Get ready for the Weekend – Get ready for the week! So it’s Friday everyone! Take a moment today to reflect on your week. How active was I? Did I eat healthy? Do I even know if I ate healthy? What do I need to work on? How can I use the weekend to set myself up for success next week? If you aren’t able to answer some of these questions I totally get it. If I don’t log my food I can’t tell you what I ate yesterday let alone the whole week. I log my workouts too, both to stay accountable and to keep track. Let’s discuss some strategies for a successful week! I look at my week first to get a feel for my evenings. If we have kids sporting events or some other activity I will usually do a crock pot meal or plan for a dinner out. Once I know about where I am going to be when I can sit down and plot out my meals. 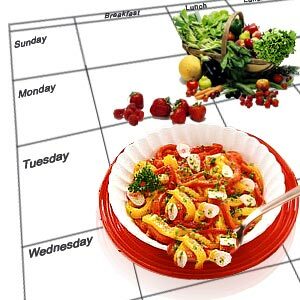 I use the Beachbody meal planner so I am sure to stay within the percentages I am working with (fat%, Carb% and Protein%) or if I am feeling really ambitious I will plan out my meals and enter them in www.fitday.com which can also give you the percentages. The Beachbody tool is great because it lets you swap out items, add items etc. and then gives you a grocery list and is customizable if you are a club member. Now I just need to shop! I put my meal plan on the fridge – I also plan my sons lunches and breakfasts as he is on a super athlete’s diet of 3100-3300 calories a day. It takes some planning to put out that much food. J I’ll do a blog post on how I came to that plan for him another day. Once it’s on the fridge everyone in the family knows the plan. It reduces the “what should we have for dinner tonight?” conversation. This is my goal every week – we aren’t perfect but we usually get it going. If you are one of those amazing people that get up an hour or two before everyone so you can have your workout early in the day – awesome! If you aren’t and you work out at different times of the day based on your schedule then listen up. Plan your times! Put it in your calendar – set reminders and use the Wowy SuperGym! The Wowy SuperGym logs your time and enters you into the pool to win money for doing your workout. You are more likely to do your workouts if you have a plan! Post your plan, share it with a friend and be accountable! Now let’s say you are bored with your workout, you aren’t being consistent anymore and you need something new. Let me know and I can help you find something that will work with you towards your goals. Beachbody programs switch up your workouts so it’s much harder to become bored. Send me a note and I will help you get started on something new or click here to get started! Lacking Motivation? Join a challenge group! The group would all be doing their workouts everyday, each person holding each other accountable and everyone motivating each other. It’s a great way to stay focused and have support! I have new groups being formed every month. Contact me for more information. So take time today and reflect on your week and do better next week! If you take the time to reflect you are likely to make positive changes that can benefit your long term health! As always, if you need help or support please contact me.